Long before Europeans settled the Coastal Plain and moved into the Piedmont during the seventeenth and eighteenth centuries, native peoples had already developed communal beliefs about the origins of their people, how the world had nurtured them, and where sacred places existed. They took their cues about the sacred from the natural world around them and from the holy men and women who they believed had a special openness to the spirit world. Cherokee religious myth, for example, proposed that the earth was the creation of higher beings that left the sun and moon to watch over and control it and all human life. Springing from this essential creation story was a system of worship and ceremonies that touched every aspect of Cherokee life and activity, including marriage, child rearing, communal obligation, arts and crafts, hunting, and agriculture. Religious life changed drastically for Native Americans, however, as Europeans invaded from the east and north and began to lay claim to Indian lands in the late sixteenth century. European Christianity was profoundly different from the religion of Native Americans. The faith was centered on a book, the Bible, and instead of living in harmony with nature, the settlers claimed dominion over it as they and their successors changed the landscape through new farming techniques and the building of towns. The first Christians to settle and remain in North Carolina were Quakers who migrated over the boundary with Virginia in the 1670s. After North Carolina was separated from South Carolina in about 1712, the North Carolina Assembly passed several ineffectual vestry acts that required citizens to pay taxes for the support of Anglican priests. (The vestry is a group of church members who manage the everyday affairs of the church.) Quakers, joined by Presbyterians, Baptists, and even some Anglicans-called "dissenters" because of their desire to separate themselves from the Church of England-were angered by these taxes. They were further dismayed when, beginning in 1704, they were required to take an oath to the English monarch and the Church of England, despite the fact that in the past Quakers had enjoyed the right of affirmation rather than taking an oath, which was condemned by their religion. This meant that unless they swore an oath they could not legally hold office. An act of 1765 established support for a weak Church of England, which was subsequently disestablished by the American Revolution. The majority of North Carolina's Christians of this era belonged to Protestant sects outside of the Church of England. Organized Presbyterian activity came to the North Carolina Piedmont during the 1730s to 1770s and to eastern counties (Duplin and New Hanover) as early as 1736. The first large group of Presbyterian Highlanders from Scotland made their way up the Cape Fear River and settled at Cross Creek (now Fayetteville) in 1746. The Presbyterians were the first group to attempt to establish a college, with the founding of short-lived Queen's College in the 1770s in Charlotte. Baptists date from at least 1714, although their first church-to which both Free Will and Separate (Missionary) Baptists trace their beginning-was not established until 1722 in Chowan County. The first North Carolina Lutherans were wiped out by the Indians in 1711. Permanent Lutheran congregational life dates from the mid-eighteenth century with the coming of German immigrants from Pennsylvania into the Piedmont. Initial members of the Reformed tradition of Protestantism came into the Pamlico section of North Carolina from Virginia in 1690. Many of the members also were killed by the Indians in 1711, and their survivors went into the Presbyterian Church. By the 1750s Moravians had settled in the Piedmont. During and after the Revolution, Methodists came into the region as well. Catholic immigrants first settled in the Pamlico Sound region as early as 1737. The first Jewish settlers came into the colony from Barbados and were of Spanish-Portuguese origin. Wilmington seems to have had a Jewish community as early as 1738. Jews who came into the state in the second half of the nineteenth century were mostly immigrants from Germany. Gradually, the colony and state attracted a variety of settlers who expressed themselves in a number of faiths, while many African slaves came in chains and bereft of the social solidarity of either religious or ethnic identity. By the end of the 1820s, immigrants of both African and European descent were brought under the discipline of Baptist, Methodist, Moravian, Episcopal, Lutheran, Campbellite, and Presbyterian Churches; in Baptist and Methodist groups, African American men were even allowed to preach. 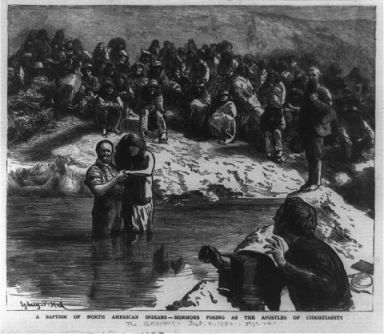 "A baptism of North American Indians - Mormons posing as the apostles of Christianity." 1882, wood engraving. Image courtesy of Library of Congress. Available from http://www.loc.gov/pictures/item/97504459/ (accessed June 11, 2012).